KUALA LUMPUR: The Ministry of Entrepreneur Development (MED) aims to increase the contribution of small and medium enterprises (SMEs) in the manufacturing sector to 7.0 per cent of the country’s gross domestic product (GDP) from the current 5.8 per cent by 2020. Its Minister, Datuk Seri Mohd Redzuan Yusof, said the improvement was achievable by creating a conducive environment for SMEs to thrive. “There are a lot of things on the drawing board right now that are ready to take off. We have to stimulate the growth in the manufacturing sector,” he told reporters on the sidelines of the “Going Public: Unlocking the Potential of SMEs” capital market seminar yesterday. During the tabling of the mid-term review of the 11th Malaysia Plan 2016-2020 in Parliament, the government said it aimed to increase GDP contribution of SMEs to 41 per cent in 2020. As at 2017, SME contribution to Malaysia’s GDP rose to 37.1 per cent from 36.6 per cent in 2016. Mohd Redzuan said the development of a strong and dynamic SME sector was vital for a vibrant and sustainable economy. “However, the policy space to foster SME contribution requires, to a great degree, a conducive framework and access to strategic resources. “As such, the MED is committed to ensure that the government’s effort towards entrepreneur and SME development will be holistic, integrated and targeted in order to pave the path for new opportunities and grow our capital market,” he said. 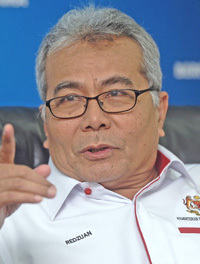 Meanwhile, Mohd Redzuan said grants for research and development, as well as, the prototype for the proposed national car would be announced early next year.